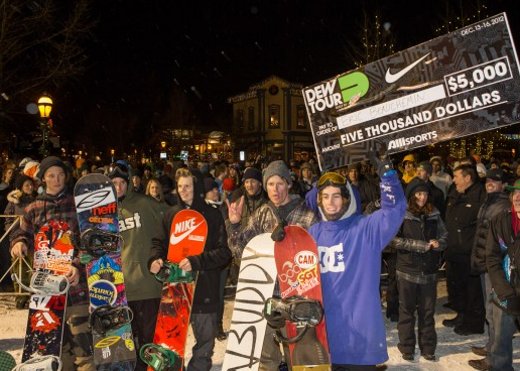 Everybody who’s anybody was in Breckenridge this weekend for the first Dew Tour event of the season. Cartel riders McRae Williams and Dash Kamp rode hard in qualifiers but falls in windy semifinals against a heavy hitting line-up of riders meant that neither Dash or McRae took their riding from the semis to the finals. On the last night of the event Nike put-on a streestyle event, a creative urban mini-shred set-up with a car, dumpster, skip and a number of obstacles you’re more likely to see in a skateboarding vid than at a snowboard event. Dash rode really well on his Dopamine and just missed out on a podium position taking the fourth spot but as usual doing it in style. Congrats to Dash!